Oh, so okay. I've come to terms with it. The Christmas decorations just aren't going to happen this year. But beyond that, we still have a Christmas tree with lights and no ornaments standing in our living room. Truly, it's still pretty when the lights are low and it does kinda sorta feel like Christmas. Since I love seeing everyone's Christmas decor tours, I thought that I'd fake one of my house using photos from last year. Oh, why the heck not? So, this is what my house would have looked like this year if life hadn't gotten in the way. Enjoy! Okay, that last one is my Mom's house but I figured while I'm cheating, I'm going to cheat it up! So there you go. I hope that you enjoyed the tour of 2010 pretending to be 2011. 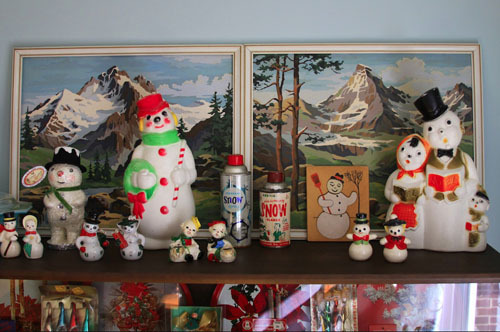 I should have the word "kitsch" slapped out of my name for my transgressions this holiday season, I know. And somewhere states away, my Mom who puts up a dozen Christmas trees is filing paperwork to disown me. Oh what a year, people. Oh what a year! Here's to a festive finale to 2011 and to 2012 being ah-mazing! I just know that next year, I'll have everything done months in advance. Mmm hmm.. Thank you! :) When I look at these pictures, I just feel exhausted. Maybe some vitamin supplements in 2012. By next year you will be Jonesing to get some Christmas because of the lack of it this year. I predict next year you will deck the hell outta some halls! I really like the display of all the stockings behind the tinsel tree. I also am blown away by your mom's Santa collection! I hope so! I can't even believe how slack I am this year. Maybe I'm just getting too old and cranky or something. And thanks! I loooove collecting Christmas stockings. The wackier the better. And I know..one of these days, I'm going to take a suitcase big enough to nab those Santas when I'm home. She'd better watch it! i seriously want to cry, that santa staircase is so amazing. i wish i had stairs! and now i feel like i have an excuse to KEEP buying santas like that! i have three already! and your stockings! and your whole freaking house!!!! i'm dying!!! and those huge deer! i'm pretty sure i found your blog with jenny over at freckle wonder posted about the day you found those deer and i was SICK over the fact that they were in a thrift in nashville and didnt come home with me!! I know - I'd loooove to have stairs. They're a pain for house cleaning but fun to decorate. And thanks! :) I promise that if I ever come across more blow mold deer, I'll let you know. These were at the Rivergate Goodwill. 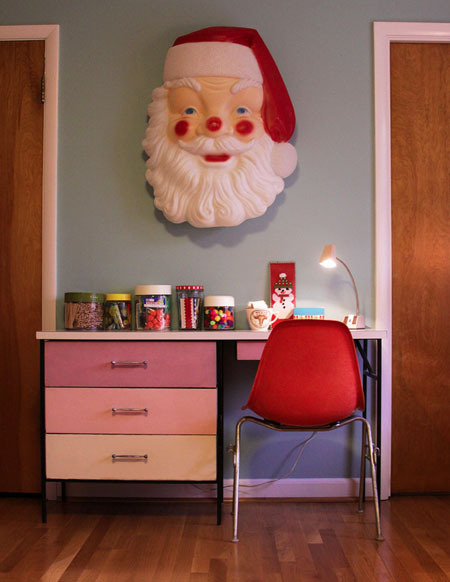 When I got the huge freakin' Santa head, the lady told me that just that morning, she'd sold the entire set of eight (or nine?) reindeer and a Santa complete with sleigh on Craigslist. A little part of me died. I've never seen the whole set in person. Start early. The minute calendars go on sale for half price buy yourself a handful stick them up where you can't miss them and circle August 8th and write beside it - begin Christmas prep. Just do it. 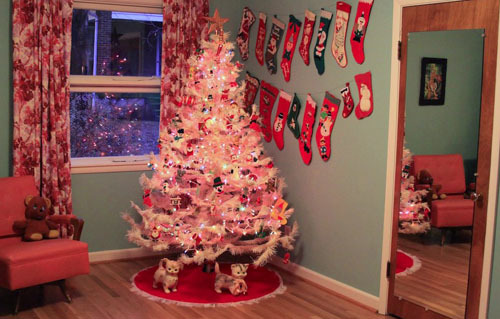 I can't stand the idea of a kitsch-less Christmas! i am so with you. we don't have a tree yet- only managed to put together the small silver one and hang some shiny brites on it. blow mold santas are on the porch but i'm gonna be honest- they were sharing that space with the pumpkins from halloween until YESTERDAY afternoon. 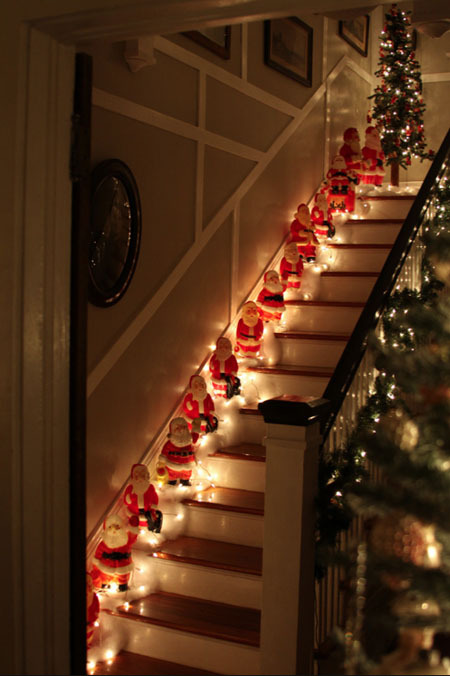 swooning over all your decor, hard to find a favorite corner but i sure do love that staircase full of santas!!!!! soooooo amazing!!! new big santa head over the desk is also just beyond awesome. Don't feel too bad. At least you have lights on a tree. We always have the tree with just lights for a day or two before we put on the ornaments. We also leave it up with just lights for a while after the ornaments are put away. I love the glow of the tree in the corner. It really helps me get through the cold and dark of winter. Looking through the old photos are fun. At least the packing away will be easy for you this year! This, of course, is why we could never be neighbors. You're all ho ho ho and I'm all up yours, Santa. It seems like the older I get the less enthusiastic I am about decorating because I have to drag it out and then I have to pack it all away again, ugh. I was feeling REALLY behind this year so Mike kind of dragged everything out, and put Christmas music on, and we put up some stuff. I think it is still a little meager, but hey what are you gonna do! Your house is gorgeous no matter what and your Mom continues to amaze me!!!! Your house looks fabulous, and I see where you inherited your decorating skills. That's 70 or so too many Father Christmases for me - I get unreasonably irritated with people who have Santa coming down the chimney and ALSO through a window on the front of their houses, there's only ONE! - but I admire the spirit behind your mum's decor and hers looks good. Your snowmen are inspired displayed against those paintings and I love a tree with vintage decorations in many colours (my favoured look in my house). I just stumbled upon your blog last night, and I am so inspired by your photos! 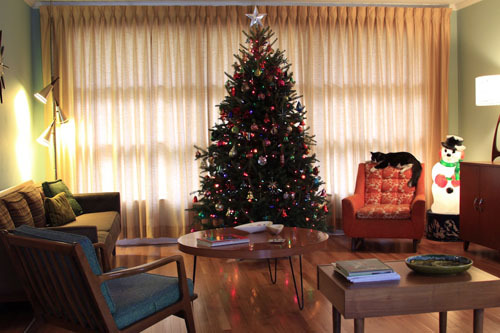 Christmas aside, I love the look of your home; what shade did you paint the walls - Holiday Turquoise? Whatever it is, I really like it! Giant Santa head unnerves me. I feel a little better now. No decorations for me this year, I'm in the process of moving. Seeing your home really put a smile on my face and I'm hoping that I'll be able to decorate my home as lovely as yours next Christmas. Thanks for sharing. Oh, one more thing...I love how your cat sneaked into at least 2 of the photos...very cute! Meowy Christmas! At first I didn't have the inclination to do Christmas either this year. My best friend died in February and I didn't have the heart. But then I got thinking how she loved Christmas and cats. So I put a tiny tree decorated with my kitty ornaments next to her photo on the entertainment center. I am glad I did it. 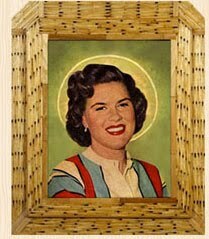 I think she would approve. OH MY GOODNESS, I see some amazing paint-by-numbers peeking out that I need to see more of! And I love your snowmens. Gorgeous!! You know I've been saying I'm going to decorate for weeks and I'm still in the same boat. Maybe it has been too warm this year? 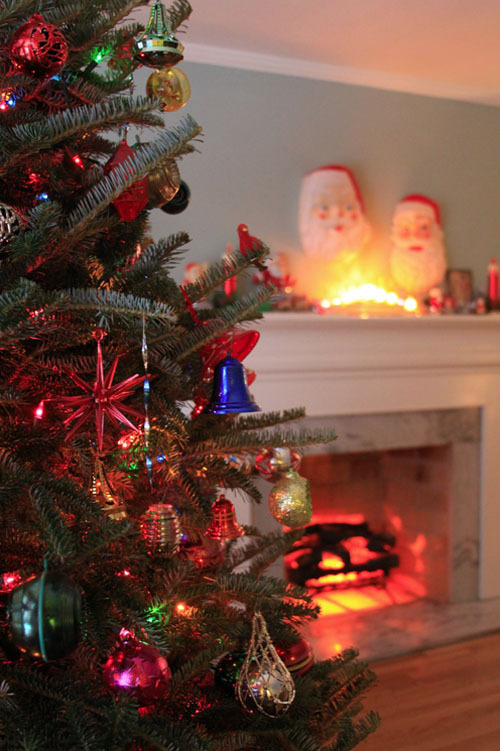 Your heart is filled with tinsel and lights and blow molds and joy... that's all the "decoration" you need. 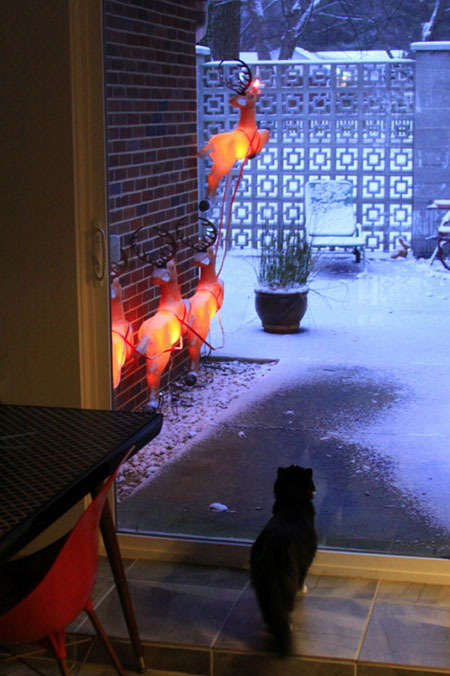 ((misting over)) If you don't have the PRETTIEST house... plus all the (even a year behind) xmas decorations? Oh, it's like a little glimpse of heaven right here on earth. Also, I love your ma's idea to use AS MANY SANTAS AS IT TAKES. So cute. The holiday is almost upon us!! HOley moley, love those Santas all down the stairs! "When I got the huge freakin' Santa head, the lady told me that just that morning, she'd sold the entire set of eight (or nine?) reindeer and a Santa complete with sleigh on Craigslist. A little part of me died. I've never seen the whole set in person." "This, of course, is why we could never be neighbors. You're all ho ho ho and I'm all up yours, Santa." Love the Santa's on the steps. Where can I find those? Hi! I'm Eartha Kitsch! Even though I DO enjoy a good salad, this site isn't about that kind of ranch dressing. 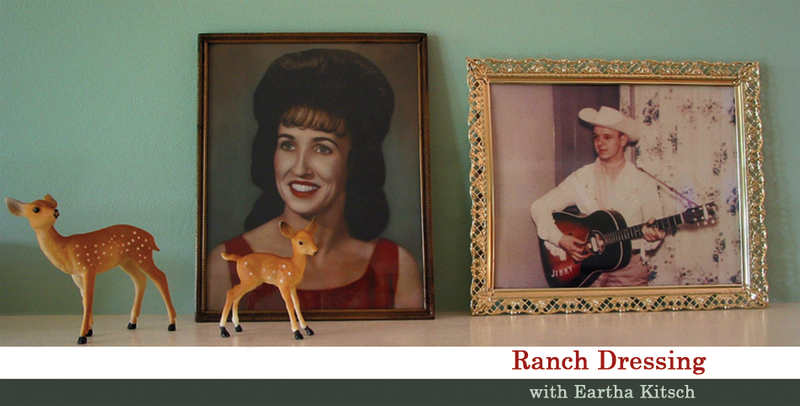 It's about the restoration, decoration and revival of my vintage ranch home. 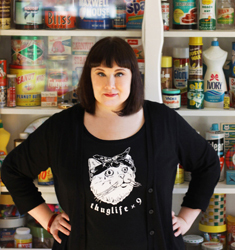 It's also about things that I consider "dressing" like fun housewares, clothing, recipes and everything else in this old world that makes life interesting and good. I live in Nashville, Tennessee and love crazy old Western things, kitsch, thrifting, swishy skirts, old photos and stories about people that I don't know (and people that I do know), crafting, absurdity, crafting with absurdity... and a million things more. Won't you join me? Y'all come! Any photos, text and other materials used on this blog are copyright to me, unless I note otherwise. 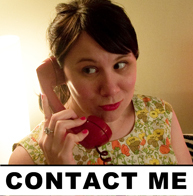 If there is something on my blog that you are interested in using on your own blog or for some other use, please contact me with your intent and get written permission from me. After permission is given, all materials used must link back to this blog. Thank you.